FusionReactor is the only APM (Application Performance Monitor) which includes high-level instrumentation combined with low-level profiling and debugging and can be used right across the whole Software Development Life Cycle (SDLC). FusionReactor gives developers and DevOps the level of depth and insight to instantly identify Java application issues. FusionReactor has completely transformed our development process from debugging through to live testing. It has been especially useful in optimizing our database queries and identifying bottlenecks. In fact, within minutes of first installing, we identified root causes to issues that had been left unfixed for years. We've had it running in production for months and not yet noticed any impact on performance. It's difficult to pick fault at all. We’re a multi-channel retailer running several websites which were was causing headaches and frustration in terms of reliability and performance. Once we started using FusionReactor, we quickly identified the issues and stability and performance massively improved, and in turn, so did customer sales and satisfaction. We’ve tried other tools but FusionReactor does everything we could possibly want; it’s a piece of software our eCommerce business simply could not function properly without. We love Fusion Reactor. We use it every day on our production servers. We recently used FusionReactor Ultimate to debug a production issue which one of our customers was experiencing with his shopping cart software. This issue would have been impossible to locate without having FusionReactor Ultimate and the Production Debugging capability. FusionReactor is incredible. I have no idea how we got along without it in the past. Even for somebody with low tech skills like myself, it is great to be able to see how new features and changes impact the system. I’ve been able to spot problems with new code updates in seconds and correct the problem almost before anyone could even notice. The availability of Planitax applications is critical to our customer base. Having a tool like FusionReactor ensures that we meet or exceed our application up-time commitments to our clients. FusionReactor is our premier tool for helping resolve our most serious application performance issues. Once installed, several years of server crashes and sluggish performances were easily identified and virtually eliminated. FusionReactor puts you back in charge of your enterprise. I highly recommend it as a stress reducer for any IT professional! I’ve recently purchased FusionReactor, FusionAnalytics and FusionDebug from you, and I could not be happier with the products you guys create. They’re truly amazing, and they have paid for themselves many times over. There is nothing out there that compares to what you guys have built – especially at the price point. We use FusionReactor to fine tune our web delivery systems. The support technician assigned to our case identified several areas of improvement that we were able to implement. These improvements resulted in an IMMEDIATE decrease in our page load times. Due to the nature of the HostelBookers.com website, it is essential that the code is efficient as possible to ensure quick page loading times. We have used FusionReactor for monitoring as well as a tool to improve code competence. FusionReactor definitely is valuable.. I used to use page level web metrics tools back in the days when WebTrends and Omniture were the standards, but we got so much value out of Google Analytics for free, that we ditched them. I should have been paying more attention to request level detail.. definitely an eye opener. FusionReactor is hands down the best thread administration tool out there. I have tried the competitors and nothing compares. FusionReactor and FusionAnalytics are excellent indispensable add-ons, which enriches the Adobe ColdFusion experience. FusionReactor has been a part of our development environment for many years now. It is an invaluable tool that helps us create, deploy and manage our ICEware system. I am amazed at how well FusionReactor is working for us. In one week, we were able to move our average page request time down from 1 second to 3/10 of a second. We were also never able to view memory usage and quickly noticed that our 300 websites were maxing out the heap. We tuned the heap and are now running lightning fast. I’ve been developing ColdFusion applications for years and can’t believe how blind we’ve actually been. Fusion Reactor is exactly what we needed. 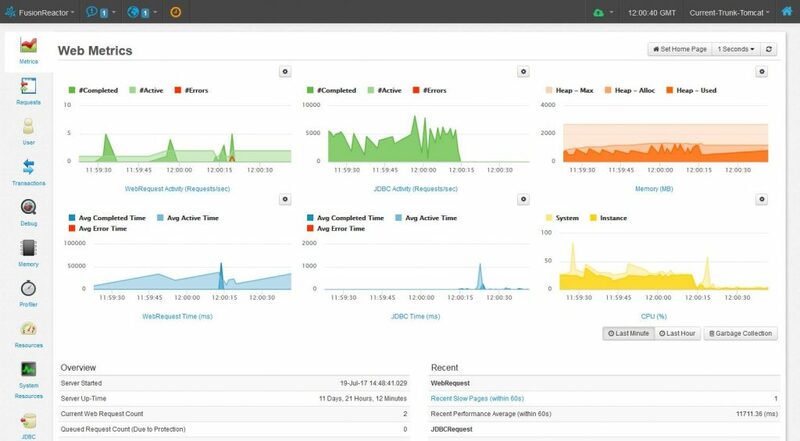 FusionReactor will cut issue isolation time down from days to minutes, and is the only Java Application Performance Monitoring Solution for Development, Test and Production. You will find all the APM features you expect; plus some unique features you didn’t.